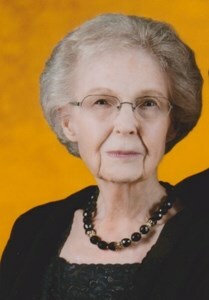 Marjorie L. (Cornelius) Mosher of Chapman passed away Sunday, January 6th at Geary Community Hospital, Junction City, KS at the age of 90 years. She was born October 11, 1928 to Roy and Mabel Cornelius at Westmoreland, Kansas the youngest of four girls. As a young girl, Marge enjoyed spending time with her family and especially loved to sew. She attended school at Westmoreland and after graduating from High School, continued her education at Kansas State University. While in college, Marge met Harold Mosher who would become her lifelong partner. Harold and Marge married August 29, 1948 in Westmoreland. Harold began his career in education in the Cloud County area and they raised four boys. After transferring to Chapman, a fifth son was born. Marge loved her boys and attended any activities where they were involved This sometimes meant driving to different towns in one day and the boys enjoyed looking out and seeing her in the stands. After the children were in school, Marge was able to continue with her second love - sewing. She went to work in Junction City at a fabric store and after a year was promoted to manager. In 1996, Marge joined the Lakeside EEU and was an active member the remainder of her life. Her sight was failing, she could no longer sew but she enjoyed being involved in her community. She had two goals - to reach 90 years of age and to celebrate the 70th anniversary of her marriage with Harold. She achieved both. Marge is survived by her husband, Harold of the home; sons Brad of Chapman; Craig (Julie) of St. Joseph, Missouri; Kirk (Patti) of Spokane, Washington; Trent (Lyn) of Indianapolis, Indiana; 11 grandchildren and 9 great-grandchildren. She was preceded in death by her son, Scott; parents, Roy and Mabel Cornelius; sisters, Mildred, Eula, and Lorna. The family requests that you remember Marge in a special way in your hearts and prayers. Marge and Harold made a decision that their memorials would be celebrated together. Therefore, there will be no service at this time. Just as they were able to celebrate 70 years of marriage on this earth, they will later have a celebration of their eternal lives together. Mass-Hinitt Funeral Chapel, of Junction City, KS, is assisting the family with cremation arrangements. Please also sign me up for Mass-Hinitt's email newsletter. Add your memories to the guest book of Marjorie Mosher. Hi Craig, I am sorry to hear of your Moms passing. I remember her as being such a pretty lady. I know it is hard to lose ones Mother. You are in my thoughts and prayers. I will never forget the love and care you showed all of us.